The delicate stripes in this rebozo were created through a complicated method of dyeing called ikat. The striped design of the main body of the piece is complemented by a net-like section and fringe on either end. All rebozos are decorated with some sort of fringe, which ranges from simple to ornate. Rebozos are worn by all Spanish women in Sonora and in New Spain generally. They serve both as a covering and as an adornment. These cloths are elaborately worked with all kinds of pretty vari-colored figures. 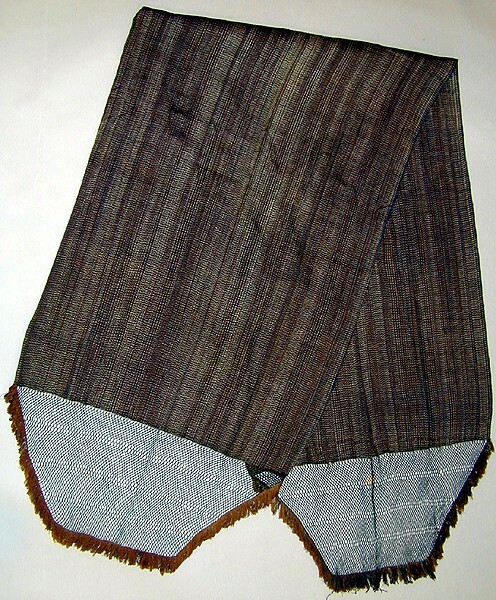 Some rebozos are made of pure cotton, others of mixed cotton and silk and still others of pure silk. The most costly are made of the finest silk with beautiful flowers and other ornaments of gold and silver woven into them. On the ends of all rebozos are long fringes of cotton, silk or gold and silver, according to the quality of the rebozo itself. Cotton rebozos are worn by the common people, and the silk ones by the gentler folk and the wealthier.